Treva is our primitive girl. 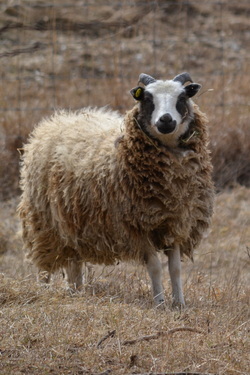 Her sire, Huntsburger Drummond, was one of the "Butter Island" sheep, which came from Scotland and lived wild for several years on an island off of Maine. 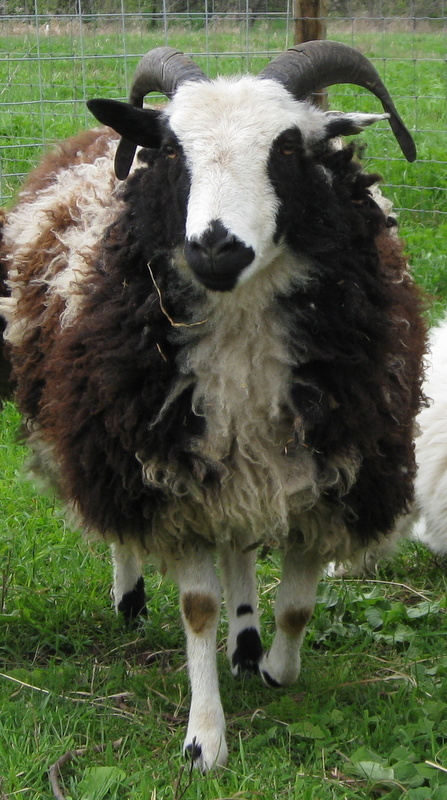 Treva has a primitive fleece which is fairly straight and soft with a long staple and only slight defineable crimp. We are privileged to have Treva's rare genetics in our flock. She is my husband's favorite sheep! 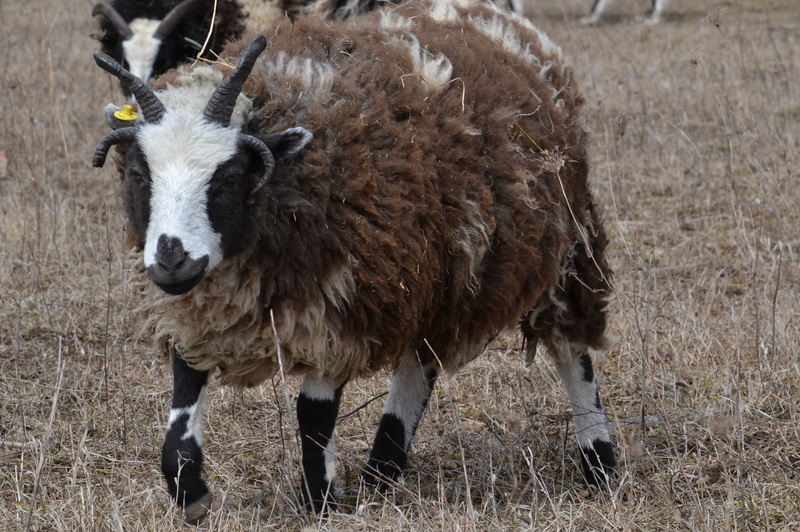 Jasmine is a beautiful four-horn black and white Jacob with elegant lines and a very soft, crimpy fleece with a shorter staple. She has a regal presence about her; we call her our beauty queen! 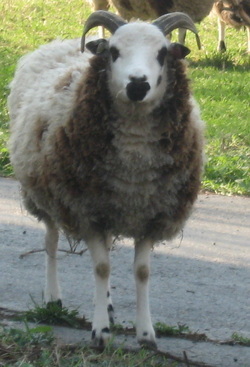 Sage came to us as a yearling bred ewe. She is our five-horn girl, though two of her lateral horns have fused, so she appears to be a four-horn. 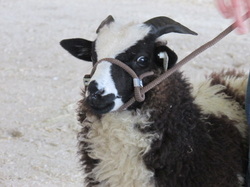 Her fleece is black and white and has gorgeous crimp and a lovely soft handle. Sage is our most gentle, friendly girl. Jessica joined us in the summer of 2013. 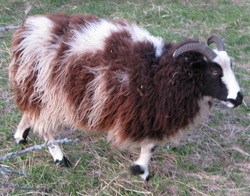 She spots an amazing horn-set, an impressive pedigree, and has a soft, crimpy fleece and beautiful markings. She is black and white and carries the lilac gene. She quickly took a dominant role in our flock, and now marches around as if she owns the place! Alaska came to us from Moose Mtn. Ranch in Colorado. She is a "chocolate" lilac--which means her spots and markings are a brownish-gray color rather than black, like our other ewes. 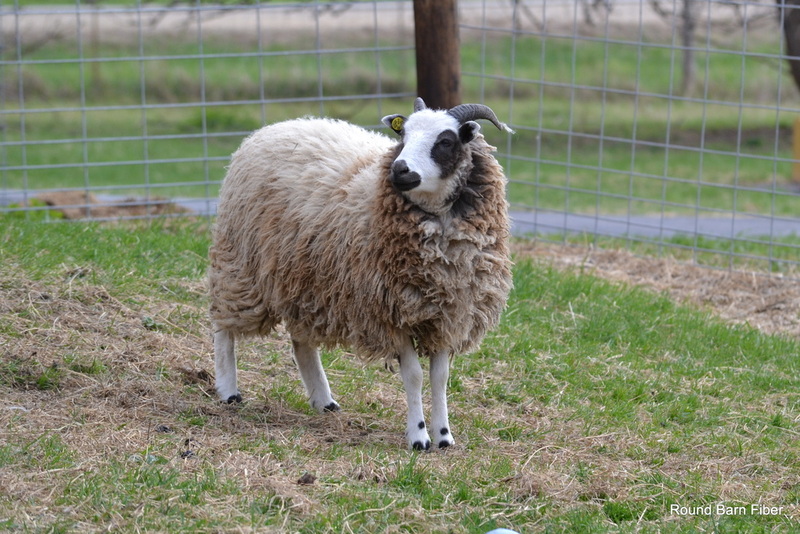 Her lilac genetics, lovely markings, strong and beautiful horn-set, gorgeous fleece, and fresh bloodlines add a great deal to our flock. 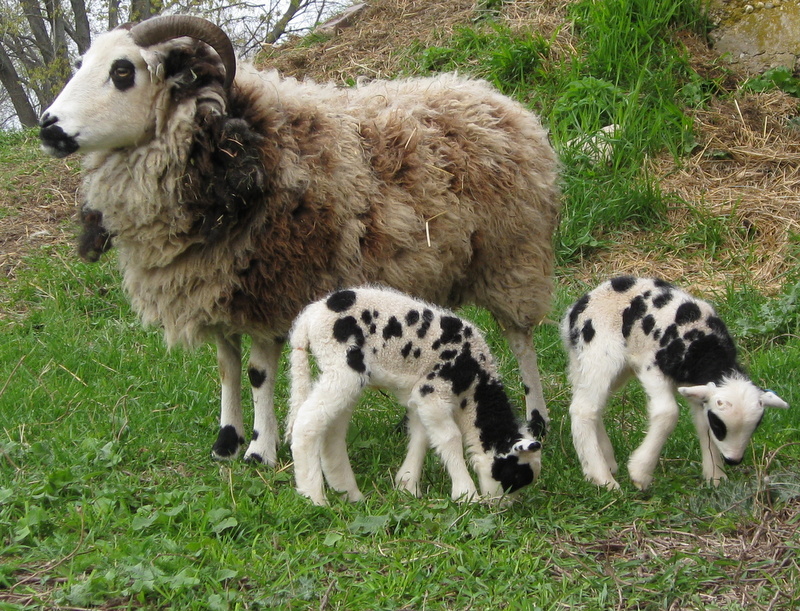 We are eager to see her first lambs this Spring! 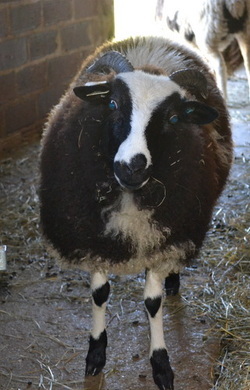 Olivia is a two-horn, black and white ewe who brings more primitive genetics to our flock. Her dam is from one of the oldest Jacob flocks in America. 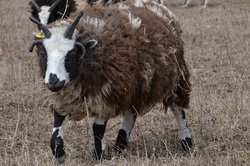 Her fleece is long, wavy, and soft. 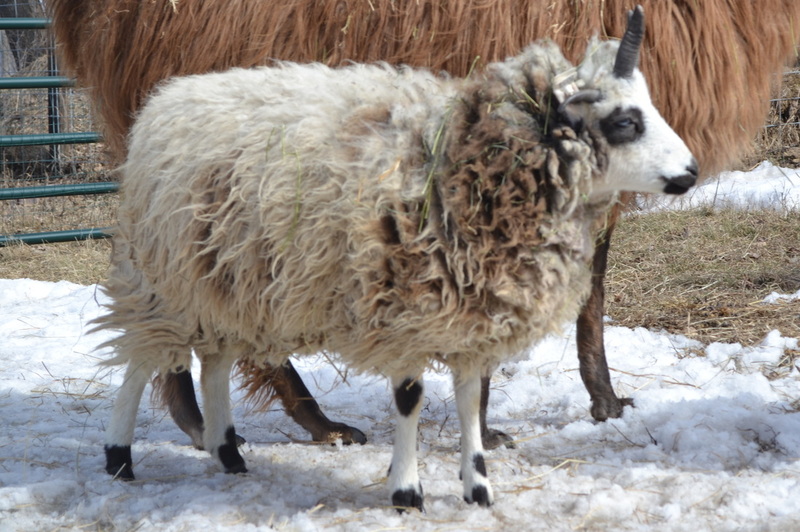 She is our only sheep with an intact tail! Olivia was a bottle baby, and while she has settled in with the flock marvelously, nevertheless she adores human companionship. She will come up for pets when we do chores in the barn, and follow us around like a puppy. 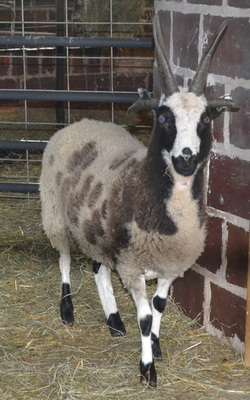 Quinn came to Round Barn Farm last fall, all the way from Painted Rock Farm in West Virginia. 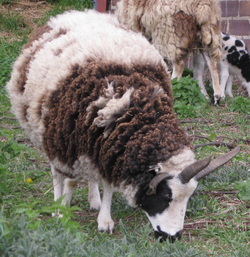 She is a two-horn lilac ewe with an extraordinarily open, soft Jacob fleece with amazing length and crimp. She has the most beautiful markings, and her sire and dam are two of my favorite Jacob Sheep! We are honored to bring Painted Rock genetics to our flock. I fell in love with Tessa the first time I saw her picture. 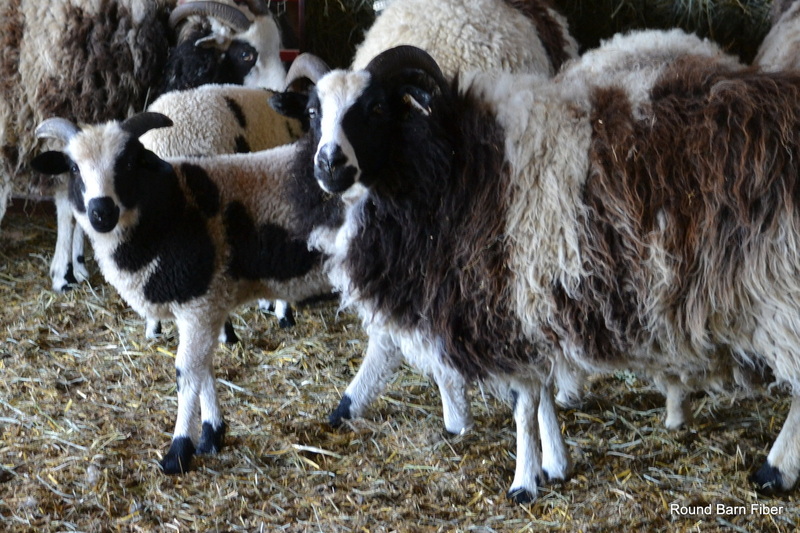 She made the long journey from West Virginia to join Round Barn Farm in the Fall of 2013. 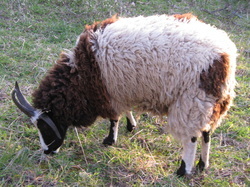 Tessa is a four horn lilac ewe. She has a very long staple to her soft, crimpy fleece, and has a lot of gorgeous color. Her horns are coming in very nicely, and I love her bloodlnes. We are so pleased to welcome her to our Round Barn flock!